Islami, S. Yahya. (1391). Veiling Architecture Privacy in Loos and Le Corbusier. معماری و شهرسازی آرمان شهر, 5(8), 1-10. S. Yahya Islami. "Veiling Architecture Privacy in Loos and Le Corbusier". معماری و شهرسازی آرمان شهر, 5, 8, 1391, 1-10. Islami, S. Yahya. (1391). 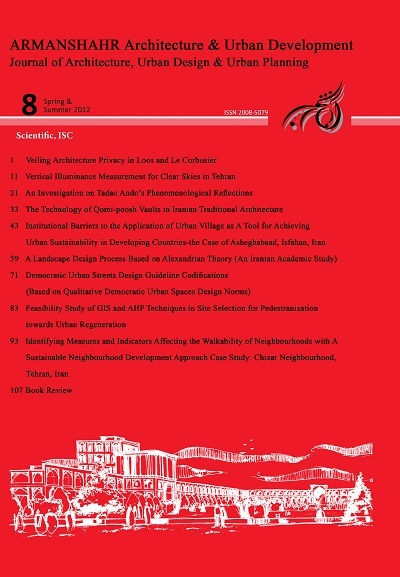 'Veiling Architecture Privacy in Loos and Le Corbusier', معماری و شهرسازی آرمان شهر, 5(8), pp. 1-10. Islami, S. Yahya. Veiling Architecture Privacy in Loos and Le Corbusier. معماری و شهرسازی آرمان شهر, 1391; 5(8): 1-10. Assistant Professor, School of Architecture, College of Fine Arts, University of Tehran, Tehran, Iran. Barthes, R. (1980). La Chambre Claire. Paris: Editions du Seuil. English translation, Howard, R. (1982). Camera Lucida: Reflections on Photography. New York: Hill and Wang. Baudrillard, J. (1990). Seduction. New York: St. Martin’s Press. Baudrillard, J. (1994). Simulacra and Simulation, trans. Sheila Faria Glaser. Ann Arbor: University of Michigan Press. Benjamin, W. (1969). H. Arendt (ed. ), Illuminations: Essays and Reflections. New York: Schocken Books. Colomina, B. (1994). Privacy and Publicity, Modern Architecture as Mass Media. London, England: The MITPress. Debord, G. (2006). The Society of the Spectacle. (K. Knabb, trans.). London: Rebel Press. Lacan, J. (1988). The Seminar of Jacques Lacan: Book I, Freud’s Papers on Technique 1953-1954. (J. Miller, ed.).(J. Forrester, trans.). New York and London: Norton. Le Corbusier (1991). Precisions on the Present State of Architecture and City Planning. (E. Schreiber Aujame,trans.). Camb. Mass. ; London: The MIT Press. Le Corbusier (1931). Towards a New Architecture. (F. Etchells, trans.). London: John Rodker. Collected Essays, 1897-1900. Cambridge, Mass. : The MIT Press. Loos, A. (2002). Ornament and Crime (1908). Crime and Ornament, The Arts and Popular Culture in the Shadow of Adolf Loos, (pp 29-36). Los Angeles: XYZ Books. Loos, A. (1982). Spoken into the Void Collected Essays 1897-1900. Cambridge Mass. ; London: The MIT Press. Mulvey, L. (1989). Melodrama Inside and Outside the Home. Visual and Other Pleasures. London: Macmillan. Rowe, C., Slutzky, R. (1976). Transparency: Literal and Phenomenal. The Mathematics of Ideal Villa and Other Essays, (pp 159-185). Cambridge Mass. ; London: The MIT Press. Semper, G. (2011). Style in the Technical and Tectonic Arts or Practical Aesthetics. The Four Elements of Architecture and Other Writings, (pp 255-6). Cambridge: Cambridge University Press. Wigley, M. (2001). White Walls, Designer Dresses: The Fashioning of Modern Architecture. Cambridge Mass. ;London: The MIT Press.